Cotton picking and ginning mid-September through October 31. Selected by Rand McNally as a “MUST SEE SITE.” Contrast 1800's historical methods (drag a sack through the fields if you like) and the computerization of today’s farming and ginning. Rare, historical steam cotton gin, slave cabins, plantation store and modern cotton gin. Admission $15 adults, $5 students 6–18 yrs. 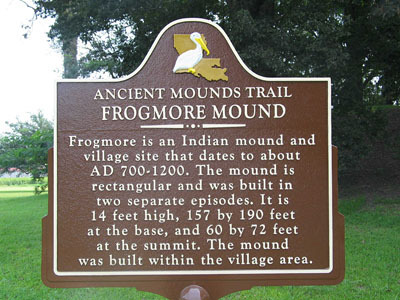 Frogmore has received the Louisiana Tourism award and has been featured in Country Discoveries magazine, AAA Southern Traveler, Louisiana Cultural Vistas, and other magazines. Frogmore has even been in Public Broadcasting System documentaries! Come see what we've got at Frogmore! A golf cart is available for handicapped persons and complimentary beverages are included in all group tours.